Drive, the motivation to pursue goals, even when that pursuit becomes difficult. Perseverance is a most excellent virtue. A virtue that any one can chose to develop. There are many examples of perseverance in our lives. Just think of the people around you and in your life, which of them is displaying perseverance? Who isn't? Perseverance is simply about not giving up. Some times it's about reaching a lofty goal like "enlightenment", other times it about getting out of bed in the morning. Perseverance, however, is blind. It needs to be tempered with vision and wisdom. With out vision and wisdom to temper perseverance and give it direction a person will quickly find themselves persevering in a way that is harmful for themselves or others. An example is the workout addict, who, despite his body breaking down, persists in exercising to the point of self harm. Men who bike so much to the point of infertility from the bike seat, to woman who stop menstruation due to a lack of body fat. Yet it may be these same people who need this kind of perseverance to finish first. 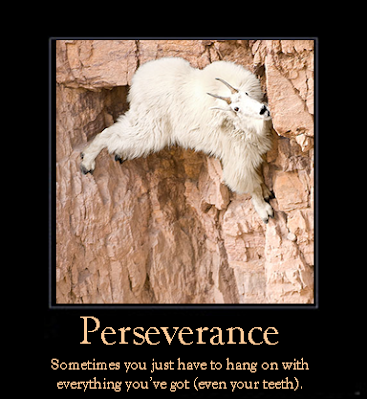 I have displayed perseverance and wisdom recently in my job. In the last 48 hours I have logged 24 hours of work with only 5 hours of sleep. As I was starting my double shift yesterday, the scheduler asked me if I wanted to work another double shift today. I told her no. To have said yes would have been harmful to my body, and relationships. I was already pushing my thresh hold as it was. I put in a 16 hour day with only two 30 minuet breaks. I persevered. I had not seen my step-daughter in 24 hours, and barely gotten to speak with my wife. Perseverance is one thing, but all things must have balance. No amount of money would be worth the damage both physically and relationship wise that it would have incurred to work another double. I think one the greatest acts of perseverance I have ever learned about is the story of Aron Lee Ralston. While climbing and bouldering, he got his arm trapped by a boulder. Though he made a gross error by not telling any one where he was, he persevered. After 5 days trapped and dehydrated, he cut off his arm with a dull pocket knife, and hiked to safety. Perseverance and pure intestinal fortitude saved his life, where many others would have simply given up and died. Perseverance is a powerful virtue to have. It can be used daily, in real life. Yet at the same time it is the virtue of "last resort". When all else has fled, wisdom, courage, vision, hospitality, ect., when all else goes wrong and things are "FUBAR" it is perseverance that will get a person through it and back to a better place.